If a sauce could have charisma, that’s how I would characterize Romesco Sauce. It’s a vibrant, stunningly delicious condiment from Catalonia in northeastern Spain. I’ve come across it in cookbooks and magazines over the years, but I had never tried it before I started developing this recipe. When I pureed up my first batch and tasted it, I was wowed by its wonderfully foreign and exotic qualities – creamy yet textured, peppery but not hot, deep and rich and exciting. The base of the sauce is roasted red bell peppers and tomatoes, roasted garlic, mild chili pepper, and vinegar. Toasted nuts and bread blend in to enrich the flavor and to create a thick luxurious texture. I’ll be making batches of this all summer long! It takes some effort to make Romesco Sauce, but it’s so worth the fuss. I suggest making a big batch – this recipe will be enough for a couple of dinners for four, with enough left over to spread on several sandwiches or burgers – and it will keep for a couple of weeks in the fridge. 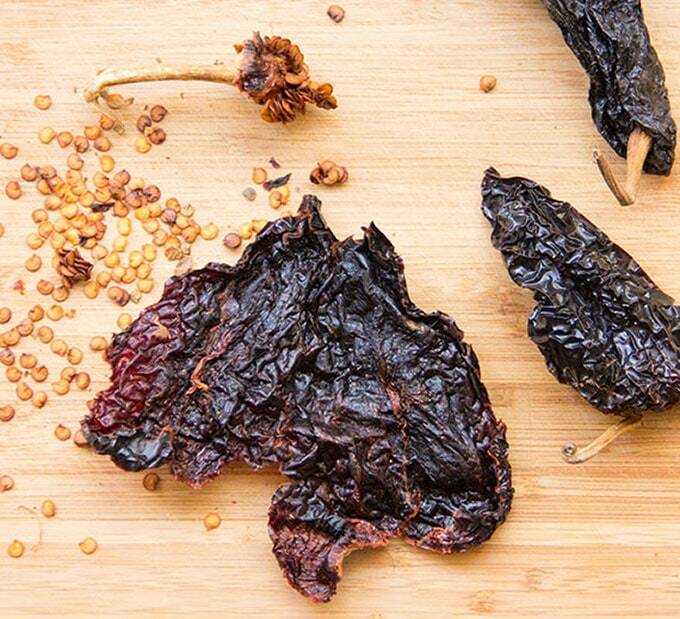 Ancho chilies are dried poblano peppers. They have a mild, sweet and fruity flavor. It’s easy to reconstitute them with a short soak in hot water. Once everything is roasted and seared and soaked, it all goes into the food processor. The texture can be modified by adding more olive oil or water. I like it on the thick side – so it’s almost spreadable. 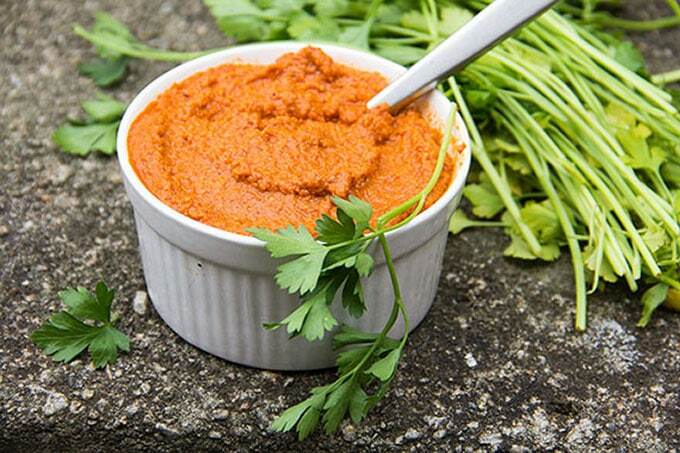 Romesco Sauce is great on the simplest piece of grilled or roasted meat, chicken, fish or vegetables. It’s got enough charisma to transform an ordinary dinner into a spectacular meal. 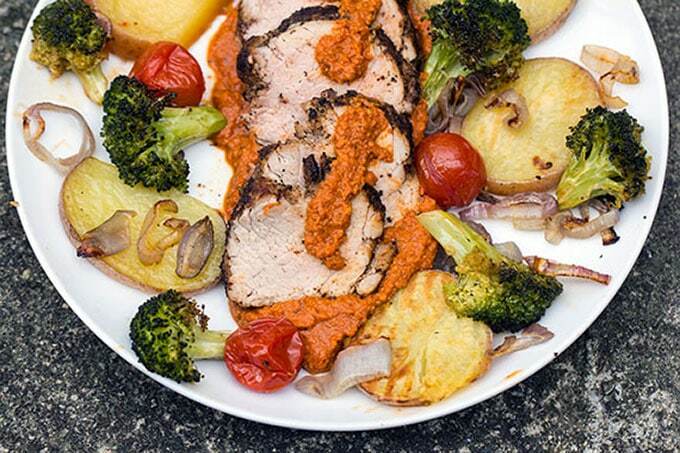 Here’s a perfect meal for testing out your delicious romesco sauce – a quick and easy sheet pan dinner of roasted pork tenderloin, potatoes, broccoli, shallots and cherry tomatoes. 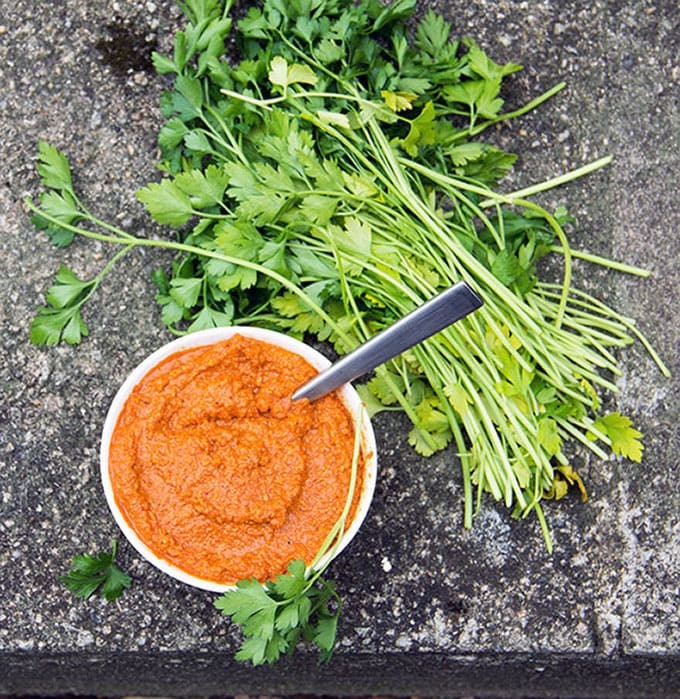 Here’s the recipe for Spanish Romesco Sauce. If you make this recipe I hope you’ll come back to leave a comment and let me know what you think! A vibrant sauce of roasted peppers, garlic and tomatoes, thickened with bread and nuts. Perfect over meat, fish, chicken or vegetables. Great on Sandwiches or burgers too. 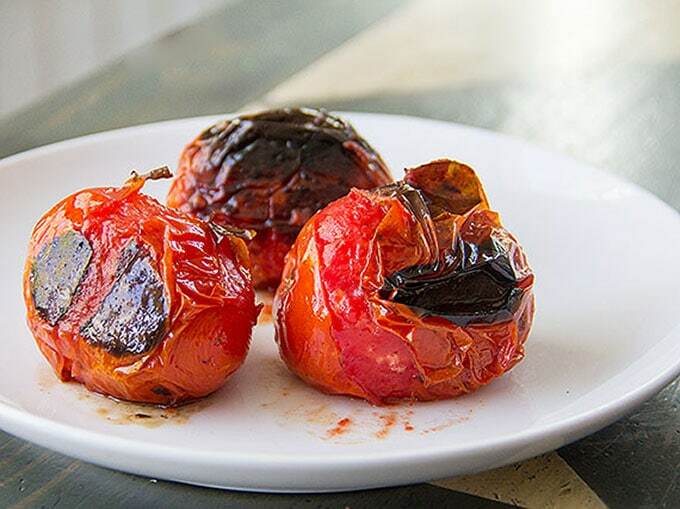 Make the Romesco Sauce: Preheat oven to 350ºF. Line a baking pan with parchment. Place hazelnuts, almonds, bread cubes, and garlic cloves on the prepared pan, setting the hazelnuts apart. 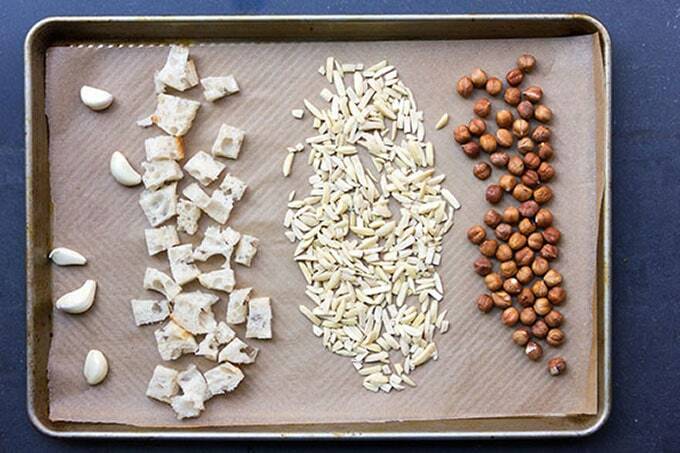 Toast everything in the oven for 12 minutes, until nuts, bread and garlic are lightly toasted. Drape a dish towel over a medium sized bowl. Scoop the toasted hazelnuts into the dishtowel fold it over the nuts. Leave for 10 minutes. 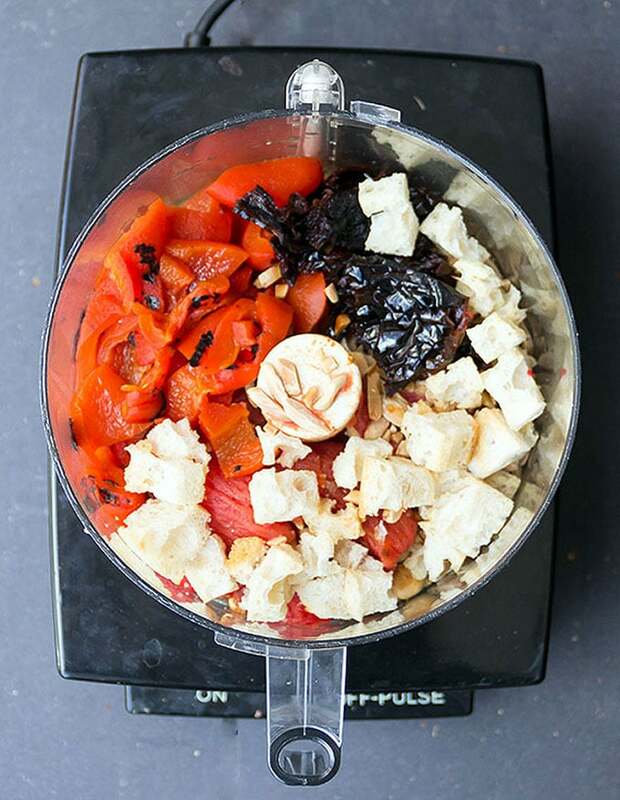 Scoop the rest of the roasted ingredients into the bowl of a food processor and set aside. Skin the hazelnuts: *After 10 minutes drop the hazelnuts into the bowl. Through the dishtowel, squeeze them and rub them against each other and down against the bowl vigorously for a couple of minutes, to remove the most of the brown skins. Scoop the skinned nuts into the food processor with the other ingredients. *Note: if you can find hazelnuts without skins, omit this step. Sear the Tomatoes: Meanwhile, heat 2 tablespoons oil in a small heavy skillet over medium high heat. sear the plum tomatoes on all sides, for about 7 minute total, until they have some large black spots and the skin starts to separate. Transfer them to a plate to cool for 5 minutes or so. 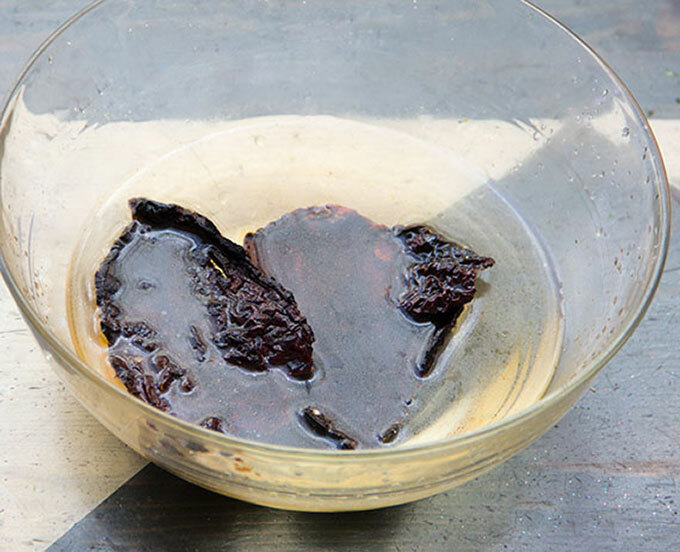 (keep the pan – you’ll use it for the ancho chili) When tomatoes are cool enough to handle, peel off the skins, slice them in half, and add them to the food processor. Sear and Soak the Ancho Chili: Put the ancho chili in the hot pan over medium high heat, and cook for about 15 seconds per side, pressing down on it with a spatula, until you see some smoke and some blistered spots. Transfer to a small bowl and cover by an inch with hot tap water. Leave for 15 minutes to soften. Chop roughly and add to the food processor bowl. Add the roasted peppers, vinegar and salt. Process the Sauce: Process, scraping down the sides when necessary, until the mixture is very finely chopped. With the motor running, slowly pour in the oil, to emulsify. If you want a thinner consistency, add a couple tablespoons of water with the motor running. Sauce can be stored for 2 weeks in an air-tight container in the fridge. Serve warm or at room temp with grilled or roasted fish, chicken, meat or vegetables, or on sandwiches or burgers. Thank you for posting this recipe! 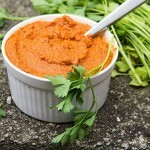 I have been searching for a good romesco sauce recipe for a while and I think yours is the ticket! When I lived with my host mother in Granada, Spain she would cover artichokes in romesco and it was my absolute favorite dish. Yum! Just tried this and it is delicious!! Great recipe!